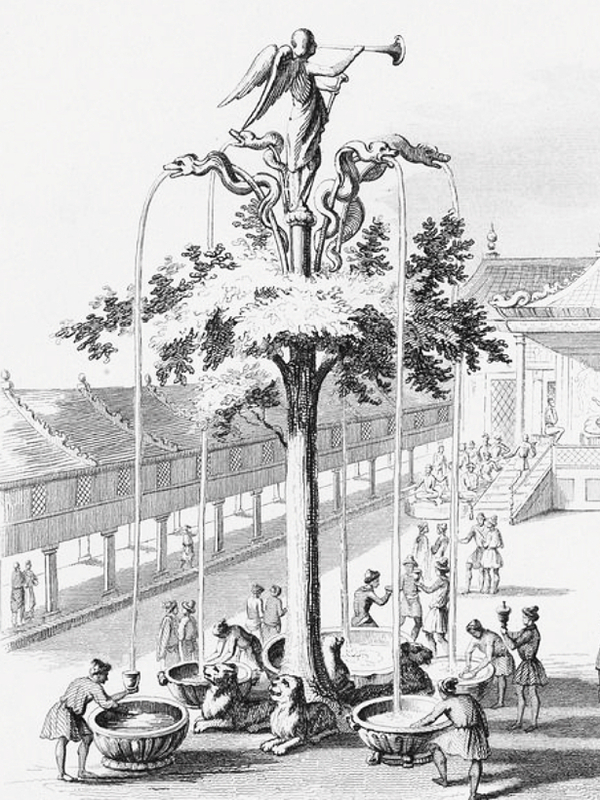 Of all the things described in William of Rubruck’s account of his travels through 13th-century Asia, perhaps none is so striking as the remarkably ornate fountain he encountered in the Mongol capital which — complete with silver fruit and an angelic automaton — flowed with various alcoholic drinks for the grandson of Genghis Khan and guests. Devon Field explores how this Silver Tree of Karakorum became a potent symbol, not only of the Mongol Empire’s imperial might, but also its downfall. Detail from an image of Möngke Khan’s fountain, based on the depiction, featured below, from Pierre de Bergeron’s Voyages faits principalement en Asie (1735) — Source. By the time Friar William of Rubruck arrived at the camp of Möngke Khan in the last days of 1253, he had pushed his body to its breaking point. The trip from Acre had taken him by way of Constantinople, across the Black Sea, and then on a punishing overland journey featuring extreme cold, a demon-haunted pass, and little enough food that his travel-companion, Bartolomeo of Cremona, had been close to tears, exclaiming “It seems to me I shall never get anything to eat”.1 And then there had been the Mongols themselves. Passing into their territory was like passing “through one of the gates of hell”, and leaving their presence comparable to escaping “the midst of devils”.2 Safe to say that the Mongols seemed quite alien to this Flemish friar. William grumbled at their (in his view) incurable greed, commented repeatedly on his distaste for the women’s noses, and spoke of the foolishness of their religion. Though in many ways a clever traveller and, despite this xenophobia, an at times astute observer, he was in other ways a fish out of water, even going about at first in bare feet on the frozen winter ground. But not everything was so unfamiliar, so strange to him. There at the heart of the Mongol Empire, he found a surprisingly cosmopolitan scene comprised of Hungarians, Greeks, Armenians, Alans, Georgians, and more. In the capital of Karakorum, he found a “Saracen” quarter with its markets and a “Cathayan” one with its artisans; he found temples and mosques, and he found a church.3 He met a Christian from Damascus who represented the Ayyubid Sultan, a woman from Metz named Pacquette who had been captured while on business in Hungary, and the son of an Englishman named Basil. Most helpful to him during his stay was an artisan from Paris named Guillaume Boucher. This Parisian smith created several pieces which William saw — an altarpiece, a kind of mobile oratory, an iron to make communion wafers, and, perhaps his most significant mark left at Möngke’s capital, the Mongol khan’s wonderfully elaborate drinking fountain. Now the words “drinking fountain” might evoke high school hallways and awkwardly hunching over to bring your face to the faucet, but this was something else entirely. Crowned by a trumpet-wielding, angelic automaton, the main structure formed a magnificent silver tree, wrapped in silver serpents and complete with branches, leaves, and fruit. At its roots sat “four lions of silver, each with a conduit through it, and all belching forth white milk of mares.”4 Up in the branches, four pipes emerged to splash a different alcoholic beverage down to silver basins waiting below. There was grape wine, fermented mare’s milk, rice wine, and honey mead, all to be ready when the khan so desired. This so-called “drinking fountain” was, for all intents and purposes, a most convoluted and extravagant bar. 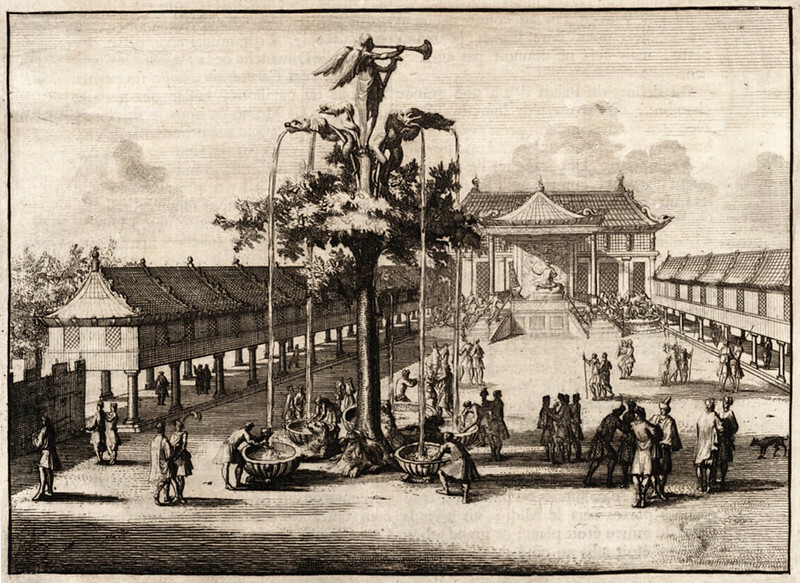 Möngke Khan’s fountain, as depicted in Pierre de Bergeron’s Voyages faits principalement en Asie (1735) — Source. Sadly, this curious creation, completed while William was at the camp of the Mongol khan, has not survived for us to admire. We are left with only the friar’s words to go on and, subsequently, with many questions. Was it as imagined in the eighteenth-century edition of geographer and poet Pierre de Bergeron’s work? Most visual representations since have been based on Bergeron’s, but did it really tower so high and appear so baroque? Was it even actually as William described? Have we correctly translated from his Gallicised Latin? Might his “lions” have been tigers or his “serpents” in fact dragons? How did it all work? A press a button, lean down, and sip affair it was not. Originally, bellows had been placed within the tree to pipe air through the angel’s trumpet whenever the khan called for a drink, but that hadn’t worked out. There was a flaw in the fountain. The bellows simply hadn’t been powerful enough, so in a slightly comedic twist, a man was placed in a space beneath the tree instead, a space which may or may not have been large enough not to be nightmarishly claustrophobic. When the call came, the man would blow, and the angel would raise the trumpet to its lips. The sound produced was loud enough to bring servants scurrying from the cavern outside the palace where drinks were stored. They would pour liquids into the tree’s roots that would quickly siphon up and pour out from above and into the basins. From there the drink would be collected by cup-bearers and delivered, in great style, to the khan and his guests. 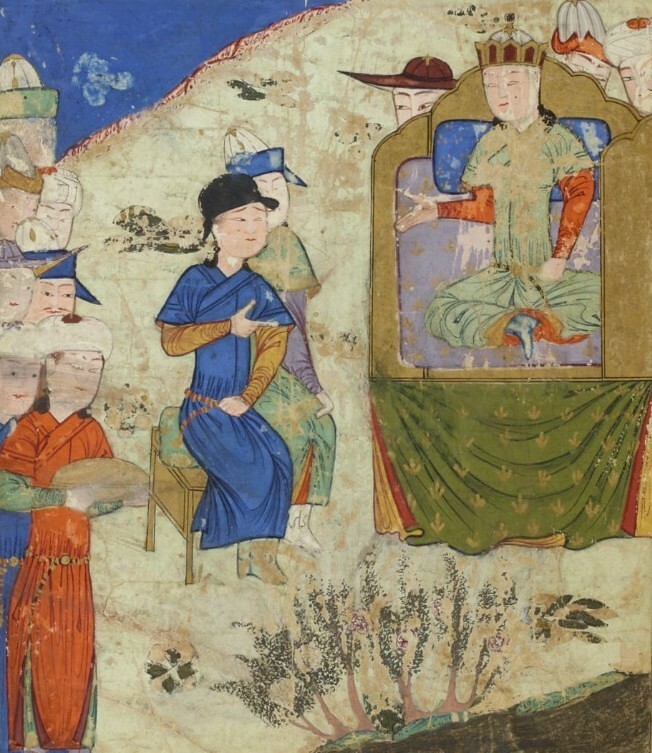 An audience with Möngke, from Ata-Malik Juvayni’s Tarikh-i Jahangushay, 1438 — Source. It was all quite unnecessary and inefficient. Simply carrying skins of milk and other beverages directly into the palace would have been quicker, with no pipes or angels required, but then, as William noted, it would be “unseemly to bring in there skins of milk and other drinks”, even common one might say.5 Basic function aside, the khan’s drinking fountain was a wonderfully grand, eye-catching piece. It had certainly caught the eye of William, who otherwise unfavourably compared the Mongol palace to the village of Saint-Denis. The fountain’s possible religious meaning is somewhat difficult to parse between French creator and Mongol client (and through the veil of William’s report), but there are possible readings. The serpents and fruit, with an angel hanging above them all, are suggestive of the Tree of Knowledge, its four liquids the four rivers of Eden. And, indeed, the designer of the fountain was a Christian who was at times called upon to play the role of priest in his community. Yet these and other elements do each yield to other interpretations, ones rooted in Chinese symbology, in Mongol Tengriism, or in Buddhism. What Guillaume’s creation perhaps expressed most clearly was riches and imperial power. One of the laundry list of items that bothered William about the Mongols was their incredible arrogance in assuming that he must be there to beg for peace, but they had every reason to expect it. Their empire was, arguably, at its peak, and envoys, kings, and sultans from far afield did indeed often come to them to do just that. They brought gifts, and the Mongol rulers would, in turn, put their tokens of imperial might on display. An example of this was the costly chapel-tent made of fine scarlet cloth and featuring Christian imagery that King Louis IX had sent to the Mongols as part of a 1249 diplomatic mission. It and other items, including fragments of the cross, were intended as gifts, but they were reported to have been received as tribute, the chapel-tent an object to be displayed and to proclaim “See? Even the Franks, as distant as they are, submit to us.” The drinking fountain, pouring Persian grape wine and Chinese rice wine from the empire’s conquered territories, would have transmitted a similar message. 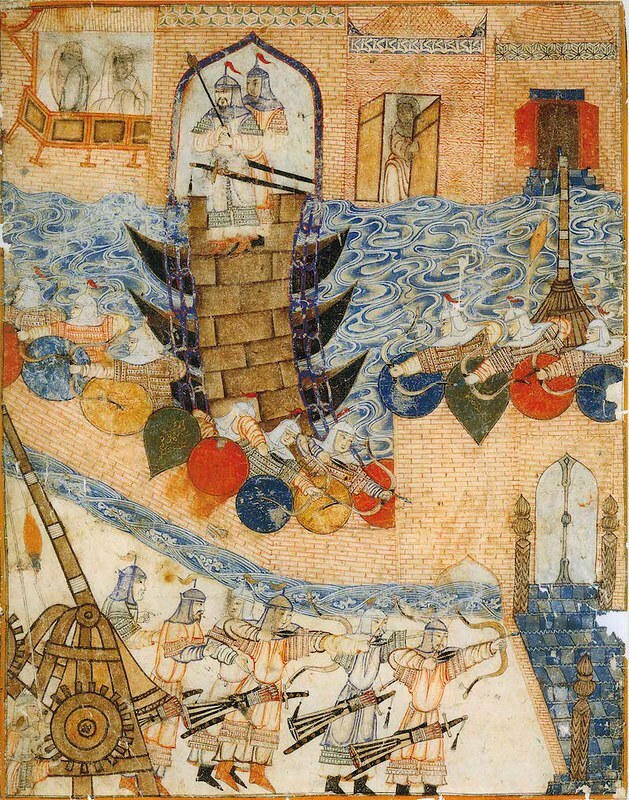 Conquest of Baghdad by the Mongols in 1258, an illustration from Rashid-ad-Din’s Jami’ al-tawarikh (Compendium of Chronicles), early 14th century — Source. Unlike the chapel-tent, the fountain had been created on-site. It had not been carried there from afar, but of course, its creator had. He had been captured by the Mongol armies that had pierced central Europe and then withdrawn in 1242, and he had neither been taken nor survived at the center of the Mongol world by chance. His captors recognized the value of skilled craftsmen and, in their conquests, would set them aside and collect them. Just as they had the tremendous wealth of an empire, so too did they collect our Parisian metalworker, Guillaume Boucher. Guillaume created something wonderful for them, an imposing testament to the reach of the Mongol Empire in the craft of a metalworker plucked from the other end of the Eurasian landmass. He, with the help of an unknown number of unknown assistants, created a towering spectacle for the khan and his guests that dispensed liquids as if by magic, a seemingly endless torrent of drinks for their enjoyment. They wouldn’t sit down to enjoy it throughout the year. It was more of a seasonal delight. Friar William reported Möngke’s court travelling in a circuit and only at times coming to the settled capital, to the palace, to the site of Guillaume’s work where they would feast and drink. And Mongol royalty did not do such things daintily. In William’s narrative, the Mongols’ drinking habits form something of a low background hum against which events are set. He doesn’t linger over the topic, but it’s always there. At each audience, he noted the bench with drinks and goblets to the side. His first audience with Möngke had been encumbered by his interpreter’s drunkenness. Making the rounds of the royalty meant drinking with all of them, often a great deal to drink. Sometimes, as the khan spoke, William would count the number of times he drank before he finished. It was not, to say the least, a dry society, and health issues among the Mongol leadership were predictably prevalent. 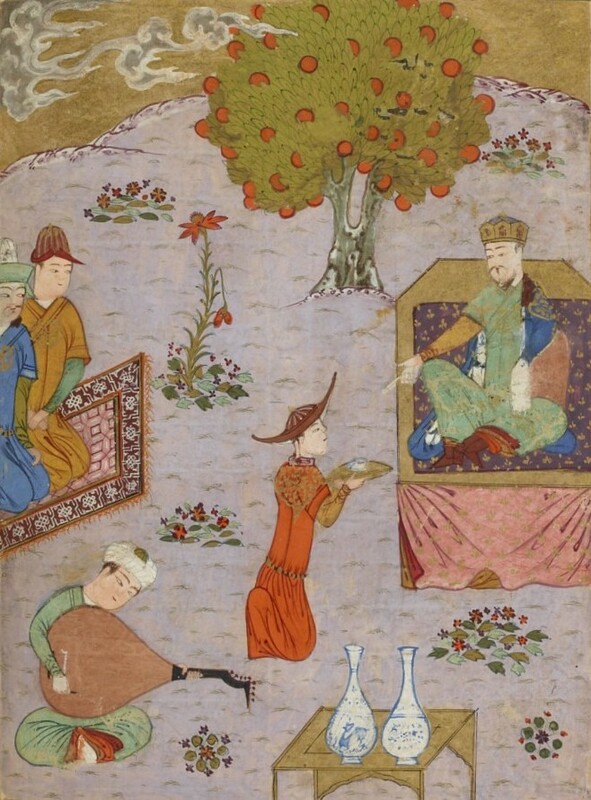 Guyuk Khan, cousin to Möngke, feasting; an illustration from Ata-Malik Juvayni’s Tarikh-i Jahangushay, 1438 — Source. Möngke’s uncle, Ogedei Khan, had problems with alcoholism recognized even within his social milieu, and he died from them despite the efforts of those around him to slow his drinking.6 Of Ogedei’s son Guyuk Khan’s death, it was sometimes said he had been killed or poisoned by a family member, but it’s often thought that he succumbed instead to his unhealthy lifestyle. A bit of a pattern was developing, and it was one that was going to haunt Genghis Khan’s dynasty for quite some time to come. It is striking then that the fountain, a symbol of wealth and empire, was also a symbol of something that so troubled that empire. Friar William’s time among the Mongols would ultimately prove a frustrating experience for him. The goals of his trip — whether you take them to be diplomatic on the part of King Louis IX or, as William would frequently claim, those of a simple missionary — were left largely unachieved. There was to be no Mongol military assistance coming Louis’ way, and William himself admits to having baptized a grand total of six souls. His travelling companion, fearful that he could never survive the return journey, remained behind in Karakorum with Guillaume, at least temporarily, his host. Guillaume seems to fall off the map after William’s account of their time together. Artifacts have been found which may or may not have been his creations, but little else is known of him or his fate. Presumably, he ended his life there at the center of what was then the most powerful empire on earth. Likely, he lived long enough to see it cease to be the center, as Möngke’s brother Kublai moved it in the direction of China and the vast empire broke up into khanates that were largely independent of one another and, increasingly, at war. For his part, Guillaume had succeeded in creating a grand symbol of a far-reaching empire and an impressive accessory to the khan’s courtly binging, an expression of wealth and power but also of the unhealthy habits that would continue to eat away at the Genghis dynasty. 6. Thomas T. Allsen, “Ögedei and Alcohol”, Mongolian Studies 29 (2007): 3-12. The Journey Of William Of Rubruck (1900), translated by William Woodville Rockhill. This book explores the rise and establishment of the Mongol Empire under Chinggis Khan, as well as its expansion and evolution under his successors. A full translation of the classic 13th-century Mongolian chronicle in accessible English, including an extensive commentary. The first annotated translation to be made from the definitive Latin text published by A. Van den Wyngaert in 1929.